Ms. Gaybrick joined Sound Point in 2017 and is a Product Specialist and Senior Associate on the Business Development team. Prior to joining Sound Point, Ms. Gaybrick was at Marathon Asset Management, where she was a Vice President of Investor Relations & Sales/Marketing, responsible for marketing their opportunistic credit strategies to institutional investors as well as servicing their existing client base. 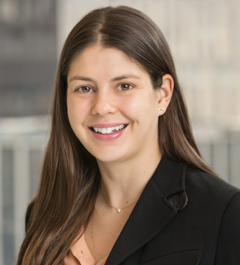 Prior to joining Marathon, Ms. Gaybrick was at Goldman Sachs, most recently as an Associate working in the Securities Division, specifically in sales & trading in the municipal bond department. Ms. Gaybrick earned a B.A. in Economics from the University of Pennsylvania.